View of the Pajarito Mountain Ski Area from Los Alamos golf course area. Note the foot hill in the foreground and to the left of the ski hill show the signs of 2000's Cerro Grande fire. Here's a link to the Google Maps view. What forces pushed up that hill or mountain? It is hard to imagine what it would have been like standing there where you stood when the earth was pushed up to make the mountain. 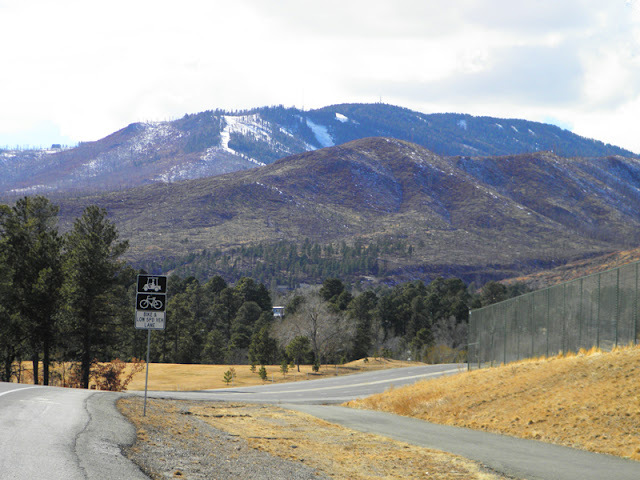 Los Alamos and the ski hill are on the southern edge of the storm tracts through the southwest. Some years we get lots of snow; some years not very much. This year the ski hill has gotten just enough snow to stay open some of the time. Currently the ski area is closed and got 4-5" new snow last night. Maybe they will be able to open.